This topic contains 3 replies, has 3 voices, and was last updated by Josie87 6 months, 2 weeks ago. Hi. 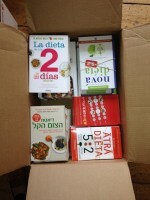 I have the books an recipes and today is my first Fast Day. Had my homemade muesli for brekkie and hoping to last through to dinner time tonight. Nervous. I have resisted the biscuits!